It was reported by the Deputy Chairman of the State Border Guard Service of Ukraine Artur Pimenov during the on-site Interdepartmental Meeting on the operation results to counter criminal offenses committed by the illegal migrants. 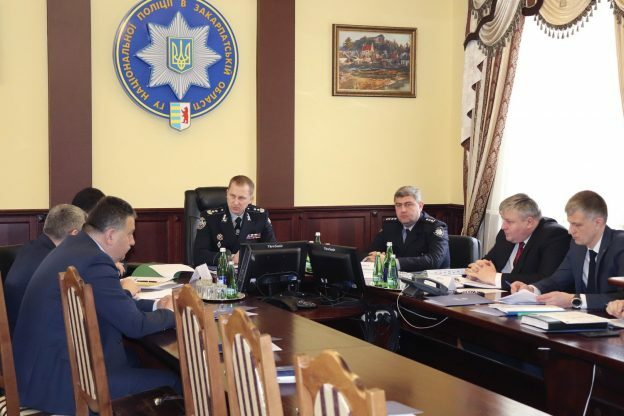 The participation in the meeting, which took place on April 12 in Transcarpathia, under the chairmanship of the first Deputy Chairman of the National Police of Ukraine Vyacheslav Abroskin and the head of the Crime Prevention Department related to the human trafficking, the National Police Artem Kryshchenko and heads of the regional departments of this unit. Currently, on behalf of the Minister of Internal Affairs of Ukraine Arsen Avakov, the law enforcement officers perform a set of preventive measures under the conditional name “Migrant” on the territory of the country. The purpose of the special operation is to expose foreigners who are illegally on the territory of Ukraine, prevention and suppression of the offenses committed by them. As it was noted by Vyacheslav Abroskin, combating illegal activities of the foreigners on the territory of the country requires the consolidation of efforts of all law enforcement agencies. “A more effective means of crimes prevention committed by the foreigners is to prevent them from re-entering after expulsion. Such activities should be carried out in close cooperation with our partners – the State Border Guard and Migration Services,” he stressed. The first Deputy Head of the National police of Ukraine also noted that in 2018 law enforcement authorities revealed more than 75 thousand administrative violations and almost 3 thousand crimes committed by the foreigners. Last year, 258 criminal organizations and organized groups were liquidated, of which 21 were on an ethnic basis. Last year, 3 268 persons were detained. There is serious experience in countering this phenomenon and human trafficking”, – said Arthur Pimenov. In addition, he noted about increase in the number of persons detained for illegal border crossing by 26 % (1,130 in 2018), due to an increase by 24% in the number of detained illegal migrants, including citizens of Vietnam, Bangladesh, Turkey, Iraq and India, on the border with the EU, especially on the Ukrainian-Polish, Romanian and Slovak areas of the border. Also, the Deputy Chairman of the State Border Guard Service noted that the Border Agency takes preventive measures by identifying potential illegal migrants directly at the checkpoints across the state border. “In 2018, 4646 persons were denied in entering Ukraine, of which 95% – at the air traffic checkpoints. In the course of joint preventive measures or operations more than 2 thousand foreigners were revealed, who had violated the terms of their stay in Ukraine”, – said Arthur Pimenov. Summing up the results of the meeting, the first Deputy Head of the National Police Vyacheslav Abroskin emphasized that the results of the activities performed within the framework of the special operation “Migrant” once again confirm the effectiveness of the joint efforts of all three departments. This entry was posted in Translated Media-News from Ukraine on April 12, 2019 by oksana.